My research interests are very broadly in plant ecology and statistical applications in ecology. My main interests and those of my students have largely been in plant population and community ecology, although our interests extend to other areas. Recent work includes plant demography at a range of spatial scales and in disturbed environments, the ecology of biological invasions, and research synthesis and meta-analysis in ecology. My students have generally worked on very independent projects for their dissertations, on a wide range of topics including plant-pathogen interactions, plant invasions in riparian systems, agricultural ecosystems, tropical ecology, and plant-animal interactions in the dispersal of invasive plants. and many others, with an "Altmetrics" score of over 1200, putting it in the 99th percentile of covered science stories internationally. 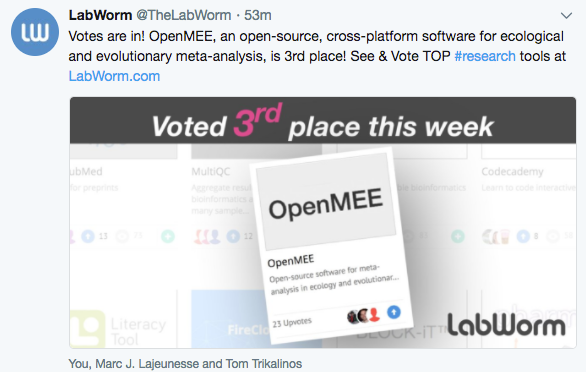 OpenMEE was voted 3rd place in LabWorm for top research tools for the week of Dec. 6 2017! Jessica Gurevitch, Julia Koricheva, Shinichi Nakagawa and Gavin Stewart. 2018. Meta-analysis and the science of research synthesis. Nature 555, pages175–182 (08 March 2018) doi:10.1038/nature25753. This article has been very widely covered in the popular press. Cang Hui, Gordon Fox, and Jessica Gurevitch. 2017. Scaling up demography: Consequences for population volatility and growth from landscape portfolios. PNAS 114: 12507-12511. Gerstner, K., Moreno-Mateos, D., Gurevitch, J., Beckmann, M., Kambach, S., Jones, H. P. and Seppelt, R. 2017. Will your paper be used in a meta-analysis? Make the reach of your research broader and longer lasting. Methods in Ecology and Evolution doi:10.1111/2041-210X.12758 . Gurevitch, J., G.A. Fox, N.L. Fowler and C.H. Graham. 2016 Landscape demography: Population change and its drivers across spatial scales. The Quarterly Review of Biology 91: 459-484. Yu, F.K., Akin-Fajiye, Morodoluwa, Magar, Khum Thapa, Ren, Jie, and Jessica Gurevitch. 2016. A global systematic review of ecological field studies on two major invasive plant species, Ageratina adenophora and Chromolaena odorata. Diversity and Distributions 22: 1174-1185. Parker, T.H., W. Forstmeier, J. Koricheva, F. Fidler, J.H. Hadfield, Y. En Chee, Clint. D. Kelly, J. Gurevitch, and Shinichi Nakagawa. 2016. Transparency in ecology and evolution: real problems, real solutions. Trends in Ecology and Evolution 31: 711-719. WE ARE LOOKING FOR SEEDS OF DRABA VERNA! Front row from left: Nicole Kinlock, Kaitlin Riley, Jessica Gurevitch, Shijia Peng, Erin O'Connor, Zheni Gusho, Maria Zambuto. Back row: Eric Mensah, Isabela Kernin, Shanxing Gong, Morodoluwa Akin-Fajiye. Erin, Kaitlin and Zheni presented outstanding posters on their research. Kaitlin was mentored by Moro, nice work!